Compassionate Living and the Ecology Center are proud co-sponsors of this event. The Ecology Center’s Executive Director, Martin Bourque, will be speaking about the history of Earth Day, its power and its future. Berkeley Earth Day brings the Bay Area environmental community together to celebrate our vision for a sustainable future. Get inspired and connect with eco-minded comrades and learn how you can further reduce your impact on the planet and have fun doing it! This event features dozens of vendors sharing their delicious sustainable foods, eco-friendly products, and epic activism. Nosh at the delicious veggie food court and hear educational and earth-friendly talks from experts, activists, enjoy uplifting music, and more! Join us for inspiring speakers, music, upcycled crafts, bamboo bikes, veggie food and much more! 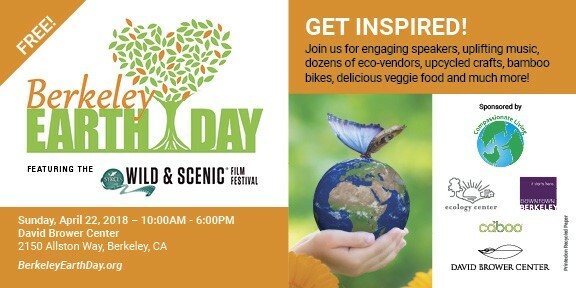 Berkeley Earth Day is excited to host the Wild & Scenic Film Fest. These films transform viewers to become committed activists, dedicated to saving our increasingly threatened planet and include an optional series of short films for children. Click here to learn more and purchase tickets!